1 A None No Power Seat 1 A is a standard Business Class suite. The proximity to the lavatory may be bothersome due to traffic and lavatory lights. Seats on the left-hand side of the aircraft (A seats) have more privacy as they face a partition in the aisle instead of another seat. 12 A None No Power Seat 12 A is designated by Air Canada as a Preferred Seat. This seat has extra legroom and knee room due to the location of the bulkhead. Passengers seated in these front economy rows will be served first and will disembark first. This section of the aircraft is also quite quiet. An extra surcharge must be paid to reserve this seat. Elite level members in Air Canada's Aeroplan program may reserve this seat without charge. The tray table is in the armrest, making the armrest immovable and slightly reducing seat width. There is no floor storage for this seat during take-off and landing. 12 C None No Power Seat 12 C is designated by Air Canada as a Preferred Seat. This seat has extra legroom and knee room due to the location of the bulkhead. Passengers seated in these front economy rows will be served first and will disembark first. This section of the aircraft is also quite quiet. An extra surcharge must be paid to reserve this seat. Elite level members in Air Canada's Aeroplan program may reserve this seat without charge. The tray table is in the armrest, making the armrest immovable and slightly reducing seat width. There is no floor storage for this seat during take-off and landing. 12 D None No Power Seat 12 D is designated by Air Canada as a Preferred Seat. This seat may have limited legroom and knee room due to the location of the bulkhead. Passengers seated in these front economy rows will be served first and will disembark first. This section of the aircraft is also quite quiet. An extra surcharge must be paid to reserve this seat. The tray table is in the armrest, making the armrest immovable and slightly reducing seat width. There is no floor storage for this seat during take-off and landing. 12 E None No Power Seat 12 E is designated by Air Canada as a Preferred Seat. This seat may have limited legroom and knee room due to the location of the bulkhead. Passengers seated in these front economy rows will be served first and will disembark first. This section of the aircraft is also quite quiet. An extra surcharge must be paid to reserve this seat. The tray table is in the armrest, making the armrest immovable and slightly reducing seat width. There is no floor storage for this seat during take-off and landing. 12 F None No Power Seat 12 F is designated by Air Canada as a Preferred Seat. This seat may have limited legroom and knee room due to the location of the bulkhead. Passengers seated in these front economy rows will be served first and will disembark first. This section of the aircraft is also quite quiet. An extra surcharge must be paid to reserve this seat. The tray table is in the armrest, making the armrest immovable and slightly reducing seat width. There is no floor storage for this seat during take-off and landing. 12 H None No Power Seat 12 H is designated by Air Canada as a Preferred Seat. This seat has extra legroom and knee room due to the location of the bulkhead. Passengers seated in these front economy rows will be served first and will disembark first. This section of the aircraft is also quite quiet. An extra surcharge must be paid to reserve this seat. Elite level members in Air Canada's Aeroplan program may reserve this seat without charge. The tray table is in the armrest, making the armrest immovable and slightly reducing seat width. There is no floor storage for this seat during take-off and landing. 12 K None No Power Seat 12 K is designated by Air Canada as a Preferred Seat. This seat has extra legroom and knee room due to the location of the bulkhead. Passengers seated in these front economy rows will be served first and will disembark first. This section of the aircraft is also quite quiet. An extra surcharge must be paid to reserve this seat. Elite level members in Air Canada's Aeroplan program may reserve this seat without charge. The tray table is in the armrest, making the armrest immovable and slightly reducing seat width. There is no floor storage for this seat during take-off and landing. 13 A None No Power Seat 13 A does not have a window. 13 K None No Power Seat 13 K does not have a window. 16 D None No Power Seat 16 D is a standard Economy seat whose proximity to the lavatory and galley may be bothersome. 16 E None No Power Seat 16 E is a standard Economy seat whose proximity to the lavatory and galley may be bothersome. 16 F None No Power Seat 16 F is a standard Economy seat whose proximity to the lavatory and galley may be bothersome. 17 A None No Power Seat 17 A is a standard Economy seat that has limited recline. The proximity to the lavatory and galley may be bothersome. 17 C None No Power Seat 17 C is a standard Economy seat that has limited recline. The proximity to the lavatory and galley may be bothersome. 17 H None No Power Seat 17 H is a standard Economy seat that has limited recline. The proximity to the lavatory and galley may be bothersome. 17 K None No Power Seat 17 K is a standard Economy seat that has limited recline. The proximity to the lavatory and galley may be bothersome. 18 A None No Power Seat 18 A has extra legroom. This seat has limited recline. The proximity to the galley may be bothersome. The tray table is in the armrest, making the armrest immovable and slightly reducing seat width. There is no floor storage for this seat during take-off and landing. 18 C None No Power Seat 18 C has extra legroom. This seat has limited recline. The proximity to the galley may be bothersome. The tray table is in the armrest, making the armrest immovable and slightly reducing seat width. There is no floor storage for this seat during take-off and landing. 18 H None No Power Seat 18 H has extra legroom. This seat has limited recline. The proximity to the galley may be bothersome. The tray table is in the armrest, making the armrest immovable and slightly reducing seat width. There is no floor storage for this seat during take-off and landing. 18 K None No Power Seat 18 K has extra legroom. This seat has limited recline. The proximity to the galley may be bothersome. The tray table is in the armrest, making the armrest immovable and slightly reducing seat width. There is no floor storage for this seat during take-off and landing. 19 A None No Power Seat 19 A is designated by Air Canada as a Preferred Seat. An extra surcharge must be paid to reserve this seat. This seat has extra legroom due to the emergency exit and has full recline. Elite level members in Air Canada's Aeroplan program may reserve this seat without charge. This seat may be missing an armrest due to the exit door. The tray table is in the armrest, making the armrest immovable and slightly reducing seat width. There is no floor storage for this seat during take-off and landing. 19 C None No Power Seat 19 C is designated by Air Canada as a Preferred Seat. An extra surcharge must be paid to reserve this seat. This seat has extra legroom due to the emergency exit and has full recline. Elite level members in Air Canada's Aeroplan program may reserve this seat without charge. The tray table is in the armrest, making the armrest immovable and slightly reducing seat width. There is no floor storage for this seat during take-off and landing. 19 H None No Power Seat 19 H is designated by Air Canada as a Preferred Seat. An extra surcharge must be paid to reserve this seat. This seat has extra legroom due to the emergency exit and has full recline. Elite level members in Air Canada's Aeroplan program may reserve this seat without charge. The tray table is in the armrest, making the armrest immovable and slightly reducing seat width. There is no floor storage for this seat during take-off and landing. 19 K None No Power Seat 19 K is designated by Air Canada as a Preferred Seat. An extra surcharge must be paid to reserve this seat. This seat has extra legroom due to the emergency exit and has full recline. Elite level members in Air Canada's Aeroplan program may reserve this seat without charge. This seat may be missing an armrest due to the exit door. The tray table is in the armrest, making the armrest immovable and slightly reducing seat width. There is no floor storage for this seat during take-off and landing. 2 A None No Power Seat 2 A is a standard Business Class suite. Seats on the left-hand side of the aircraft (A seats) have more privacy as they face a partition in the aisle instead of another seat. 20 D None No Power Seat 20 D is designated by Air Canada as a Preferred Seat. An extra surcharge must be paid to reserve this seat. This seat has some extra leg and knee room; however passengers with babies will be seated here as it is a bassinet location. Elite level members in Air Canada's Aeroplan program may reserve this seat without charge. The tray table is in the armrest, making the armrest immovable and slightly reducing seat width. There is no floor storage for this seat during take-off and landing. 20 E None No Power Seat 20 E is designated by Air Canada as a Preferred Seat. An extra surcharge must be paid to reserve this seat. This seat has some extra leg and knee room; however passengers with babies will be seated here as it is a bassinet location. Elite level members in Air Canada's Aeroplan program may reserve this seat without charge. The tray table is in the armrest, making the armrest immovable and slightly reducing seat width. There is no floor storage for this seat during take-off and landing. 20 F None No Power Seat 20 F is designated by Air Canada as a Preferred Seat. An extra surcharge must be paid to reserve this seat. This seat has some extra leg and knee room; however passengers with babies will be seated here as it is a bassinet location. Elite level members in Air Canada's Aeroplan program may reserve this seat without charge. The tray table is in the armrest, making the armrest immovable and slightly reducing seat width. There is no floor storage for this seat during take-off and landing. 23 A None No Power Seat 23 A is a standard Economy seat that is missing a window. 23 K None No Power Seat 23 K is a standard Economy seat that is missing a window. 3 A None No Power Seat 3 A is a standard Business Class suite. Seats on the left-hand side of the aircraft (A seats) have more privacy as they face a partition in the aisle instead of another seat. 39 A None No Power Seat 39 A has limited recline. The proximity to the lavatory and galley may be bothersome. 39 C None No Power Seat 39 C has limited recline. The proximity to the lavatory and galley may be bothersome. 39 D None No Power Seat 39 D has limited recline. The proximity to the lavatory and galley may be bothersome. 39 E None No Power Seat 39 E has limited recline. The proximity to the lavatory and galley may be bothersome. 39 F None No Power Seat 39 F has limited recline. The proximity to the lavatory and galley may be bothersome. 39 H None No Power Seat 39 H has limited recline. The proximity to the lavatory and galley may be bothersome. 39 K None No Power Seat 39 K has limited recline. The proximity to the lavatory and galley may be bothersome. 4 A None No Power Seat 4 A is a standard Business Class suite. Seats on the left-hand side of the aircraft (A seats) have more privacy as they face a partition in the aisle instead of another seat. 4 K None No Power Seat 4 K is a standard Executive First suite. 5 A None No Power Seat 5 A is a standard Business Class suite. Seats on the left-hand side of the aircraft (A seats) have more privacy as they face a partition in the aisle instead of another seat. 6 A None No Power Seat 6 A is a standard Business Class suite. Seats on the left-hand side of the aircraft (A seats) have more privacy as they face a partition in the aisle instead of another seat. 7 A None No Power Seat 7 A is a standard Business Class suite. Seats on the left-hand side of the aircraft (A seats) have more privacy as they face a partition in the aisle instead of another seat. 8 A None No Power Seat 8 A is a preferred Business Class suite. This seat has a lot more personal and shoulder space due to an extra ledge and the position of the bulkhead behind it. 8 K None No Power Seat 8 K is a mostly used as a crew rest on long haul flights. But this seat has extra arm and shoulder space due to an extra ledge and position of the bulkhead behind it. Each seat on the aircraft has access to In-Seat audio-video (on demand). Air Canada provides tablets for inflight movies and TV shows. Power ports are accessible from every seat in Business Class. In Economy, power ports are located one per double (seats A and H), and two per triple (seats D and E). 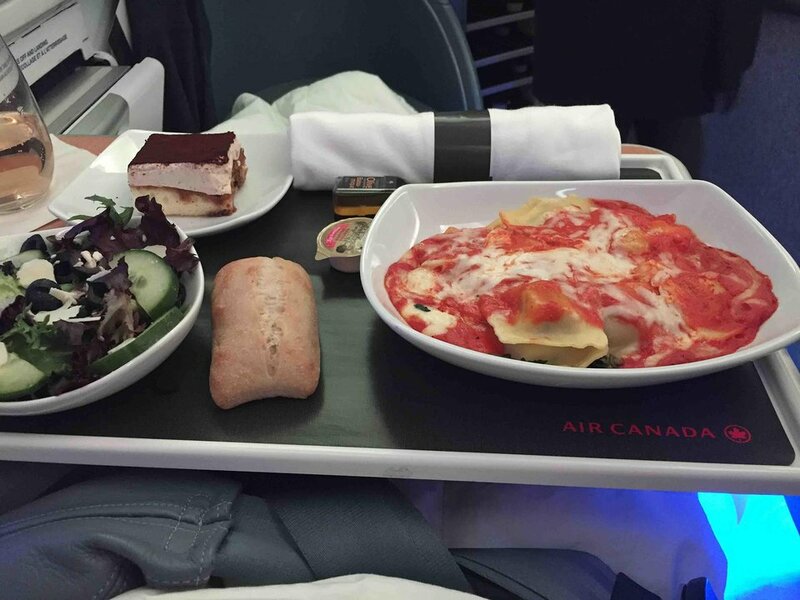 For Air Canada's international services aboard this aircraft, complimentary food and drink are offered. This version has 211 seats and two classes of service. Onboard classes include: Business and Economy. Flew AC 888 YOW to LHR, and AC 889 LHR to YOW, same seats. in Feb 2019. Good aircraft; comfortable, quiet, and powerful. Seats pretty good for economy. They tend to put young families in front row-middle, so next time might move back a row or two, Entertainment system adequate, but a little dated. B767 is known as the workhorse of the N Atlantic; not sure how I will like the A330 replacement (with 2-4-2 set configuration, as opposed to B767's 2-3-2) when we return to LHR in November 2019. Probably the best seat on the plane. You have a decent amount more shoulder room and gives you more space. In general the classic pods seats are quite narrow and lack storage space but this is the best option. 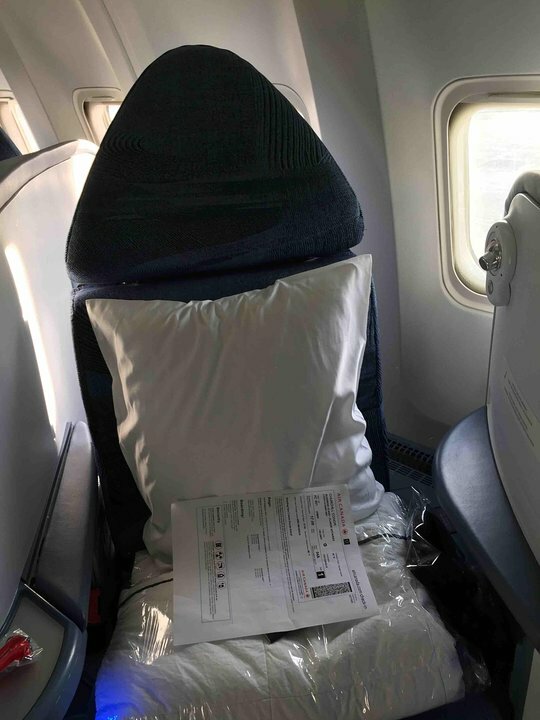 I flew on this flight on June 26, 2018, and found this seat and the one beside it (19H) uncomfortably cold due to inadequate insulation around the emergency exit. Flight attendants were aware of the issue, and freely distributed blankets. The seats do NOT have video screens. They rent iPads for in flight entertainment. These rouge flights are bare bones minimum. The seats are in fact so high that you can't see the flight attendants demonstration. Definitely an old plane (before sculpted ceilings were added), but the seat was actually fairly comfortable. Recline was fine and headrest adjusted quite a bit. This is a great Y seat! Plenty of legroom for a Y seat! Don't expect J class room like some here think a Y seat should have. The view was fantastic and a very nice fligth! This was a extra section flight from AMS on Jan 19/2018 that was meant to Dep on the 18th. But due to VERY BAD weather that day with the Airport being closed just as the inbound aircraft was on final and diverted to LHR. ALL the pax got HTL rooms and Transport from/to AMS. Lest then 2hrs after the flt on the 18th had been cancelled, I received a msg that I was moved to next day on FLT AC2125 from AC825. Some connecting flts in YYZ were delayed for those coming in from AMS. Considering 4 people where killed in the Nederlands due to this storm, Air Canada did a great job! Even the ground staff in AMS who are not really Air Canada staff tried their best. As I was leaving the baggage area, I had two ground staff jumping on me to see if I was with the flight to advise me where to go to get the bus to the htl. This plane is a disgrace. If you can pay for extra room (either premium seat or exit row), it is tolerable, but our regional jet seats were better than this long distance 5+ hour flight. I will never fly Air Canada again. They should be ashamed of themselves for continuing to use these aircraft. Awful, uncomfortable seat for flights on the Jamaica/Toronto run. No overhead compartment due to safety equipment. On the return flight the window blind was so hot from the sun it was cracked and someone could have burned their hand/arm or head if touched. Near the toilets so lots of traffic. Also this space becomes "kid central" when baby-toting parents stand in the aisles there to rock their infants and chat with other baby-toting parents. The airflow was stagnant in the plane and the lights only worked intermittently. The flight attendants appeared bored out of their heads. It is doubtful that we will fly with Air Canada on any of their planes ever again. We had to connect to a Dash 8 after this which was pure torture and requires ear plugs - be forewarned. Quite cold for this and the adjacent seat. Uncomfortably so! Do not recommend to pay extra as i did. Agree with user comment on 20D and 20E. I was booked via AC on preferred seat 19A three months in advance but bumped down to so called preferred seat 20E upon check in. This seat has less leg room than normal economy. Also was not sent the 24 hour pre-boarding information, giving me no chance to question the down grade. 20D, 20E, and 20F are not preferred seats in this Air Canada aircraft. There is no extra leg room. I could argue that there is less room than with regular seats since the galley wall is very close to the seat. Don't expect to be able to stretch your legs. I would mark those seats as bad. My flight was a nonstop from Toronto to San Francisco, a 5+ hour flight. Not terribly long but long enough to love the pod seat in business class. Would be fabulous on intercontinental flights. With only 7 other people on the aisle for the left side of the aircraft the note about foot traffic to lavatory was not an issue. The other side which had 16 total people could use that same lavatory but would not use my aisle, and a curtain mostly blocked distractions from the galley and lavatory. In truth having a mere 4 steps from seat to lavatory was far more of a plus than anyone walking past my seat. Of course you can pretty be first off aircraft in 1A also. Another plus. My seat was facing the bulkhead. I had to lean forward or turn my head back to peer out the window. Luckily the flight from yyz to fll was about three hours mostly spent in watching a movie. I felt somewhat claustrophobic. This seat is inferior due to being behind the galley. Leg room is cramped beacuse of this. Benefit of no seat tobrecline in front but leg room is needed. I'd recomend a down grade from prefered seat to standard. we flew from SFO to YYZ , the flight was about 5 hrs and all that time we could only get complimentary drinks with no snacks. bathroom is all the way in the rear so be ready to walk that far.no complimentary headseat.bring your own or pay extra. This is a poor seat, stuck right at the back of the plane with a limited recline. It's also extremely noisy because you have the right engine close by. The AC pod is more narrow than American's Transcon A321 First or Biz and its 787 Business seat and United's 757-200 First/Biz. For anyone over 6'4", the foot area will be very narrow unless you are in lie-flat mode and stretched past the headrest into the well behind it. This room in the well behind the headrest makes the lie-flat aspect actually longer than the two American planes and one United listed. The storage around the seat is also below American and United, so that's problematic if you have more than a book to store. Main issue - it's very narrow for any sitting. In-flight amenities, food, and extras as also below American and United [above]. Seat was comfortable with quite a bit of leg room for an economy class. Video system is very annoying and is hard to properly select something on the touch screen. Where you put the finger to where it shows the mouse arrow is quite a difference. Selection of movie is OK but is hard to navigate thru the menus. Food and service are rather basic and less than what other big airlines provide. 'Preferred' seat according to Air Canada but are bulkhead seat right at the lavatory. BEWARE!!!!! The seats in row 12 are 'preferred seating'. However, the extra legroom is minimal due to the bulkhead. I am 6ft and I could not stretch my legs very far. It is better than an ordinary seat, but not much. Being at the front means you get off the plane very fast, but if legroom is your priority look at the preferred seats further back. Air Canada is flying a venerable 767 from Istanbul to Toronto still - an attendant told me it will change in November when they move to a 787 and all the 767's will go to the Air Canada "Rouge" discount marque. I had the exit row 18, and it was quite nice - great legroom, didn't find the galley a bother, and actually stood in there and stretched a bit during the way. The plane was pretty threadbare, with some wire bits holding things together in the (dirty) bathrooms at the back, but it was a pleasant flight with the reasonable 2-3-2 arrangement (and my nice exit row). Food was pretty good, and service attentive - not sure I've ever gotten so much water service anywhere. Recommended, and it will be sort of sad when they go to the 9-across modern narrow seats of the 787. Flew on July 2, the seat only had AC power, did not have USB power like the other rows in front of me. The first aid kit is above you so anything going in the overhead cannot block the kit. Being behind me the location of the toilets and galley didn't bother me. Air Canada recommends being at the airport two hours before flight time(in Toronto) and I recommend that you follow that. It took me over 90 minutes for check-in, security, and customs before I got to my gate. this over-wing area can be really cold; even flight attendants confirmed this is typical. Nice to be near the front of the cabin. Decent legroom for economy, especially with no baggage by your feet (I am 6'4" and with the person in front of me reclined, did not struggle). Had an annoying time with the entertainment system. Touched to begin and it froze immediately. FA did not believe me and had me wait for 10-15 minutes (annoying). Then throughout the flight, 15A 15D and my entertainment systems would stop playing media and say 'service not available' for about 3-5 minutes. More might have been doing it as well, but I definitely noticed those ones. Headphone jacks are very touchy, pull them out slightly otherwise audio will sound like a rewinded cassette. Although inflight entertainment is nice, plane is beginning to show its age. I flew from Toronto to Sao Paulo, a 10 hour flight, and had a very good experience. The seat was comfortable, the audio/video was very good quality with a huge selection of movies. 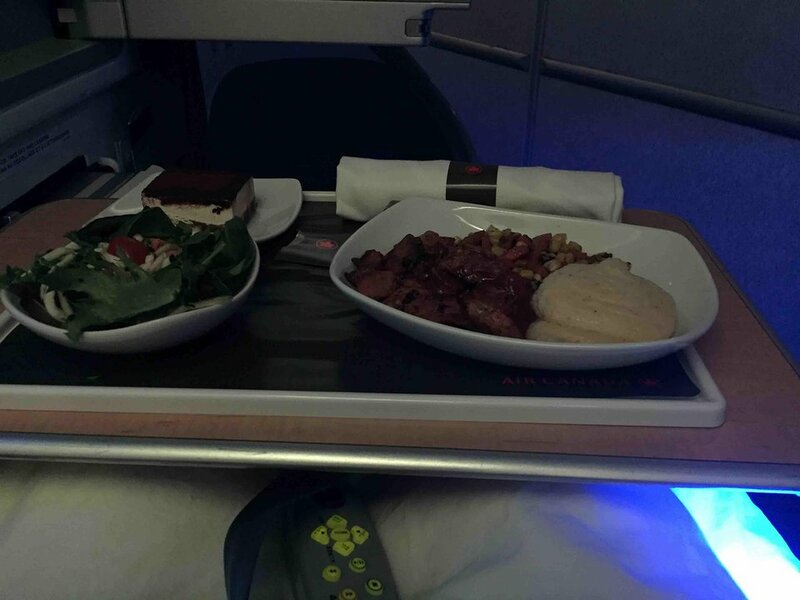 The meals were much better than I've had on American carriers. Also the flight attendants were very courteous and attentive, often coming thru offering water. Worst plane ride ever!! Seats were ok, but the power didn't work. The worst part was that the meals were disgusting. Ridiculous for 10 hour flight. Also toilets were unclean and the IFE sound quality was a shame. My advice to you is: Bring your own food when you fly this airline! 8A Is A Very Good Seat On The Air Canada 767. It Is Very Private Due To The Partition. For Overnight Flights, If You Are Trying To Get Some Sleep It Is Very Easy Because Sound Volume Is Very Low. I've flown AC to and from Japan about two dozen times now and I always go for seat 8A or 8K on this configuration. Sometimes K is set up as a crew rest. I have never had a problem with noise and it's very secluded with the bulkhead support. Any of the A seats are great if you're flying alone. As a couple, go for the F & K seats to be able to talk with each other (if that's what you want). 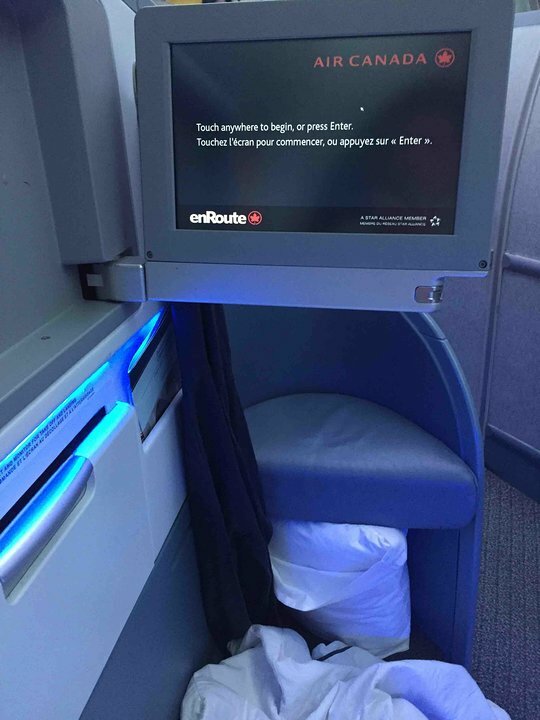 Air Canada has the best Business Class seats available when compared to ANY other airline for the price. I fly Delta, United, Singapore, Korean, etc. and you will pay 2X for less space and service. These fold flat seats are very similar to what United offers for their First Class (at 3X the price with a slightly nicer pillow). I sat in the "preferred" 8A on AC 3 from Tokyo to Vancouver. I had no problems with noise from economy or opening and closing of the cabinet behind the door. The additional ledge was not very useful as it is covered with air vent grating and also does not appear to be very clean. It was easier, if only marginally, to place the arm on the side for relaxation but only marginally. The seat feels quite private as it faces (as all A seats do) the wall between the A and middle seats. While A8 is preferred, you may suffer from noise from the Economy seats if there are noisy children. The crew also store bags in the bulkhead behind it, so open and close the door every so often. General comment: The video system is undependable as it crashes continually. Do not try and watch a movie. This seat offers exceptional legroom. 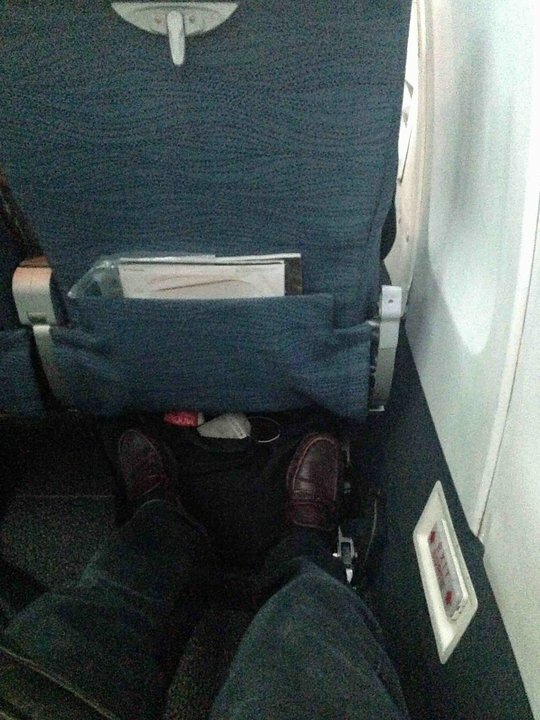 I'm 5' 11" (180cm) and while seated with the belt fastened, was able to extend my legs straight, perpendicular with the floor, and not touch the bulkhead. I had to slide down in my seat and curve my toes in order to touch the bulkhead with me foot. Even though 12E is a center seat, the extra legroom and absence of seats in front of you allows one to get in and out of the seat with ease and without having to slide across the people seated on either side of you.